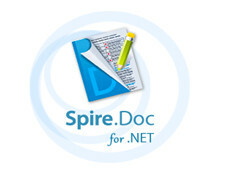 Spire.Doc for .NET is a professional Word .NET library specially designed for developers to create, read, write, convert and print Word document files from any .NET( C#, VB.NET, ASP.NET) platform with fast and high quality performance. 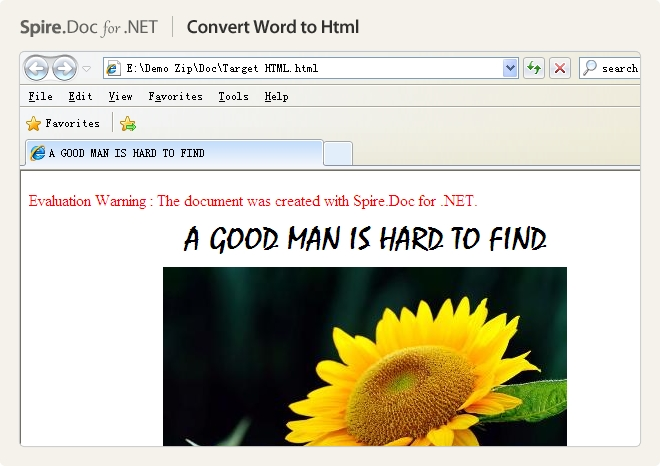 As an independent Word .NET component, Spire.Doc for .NET doesn't need Microsoft Word to be installed on the machine. However, it can incorporate Microsoft Word document creation capabilities into any developers' .NET applications. 生成和保存Word文档。(Word 97-2003, Word 2007 and Word 2010). 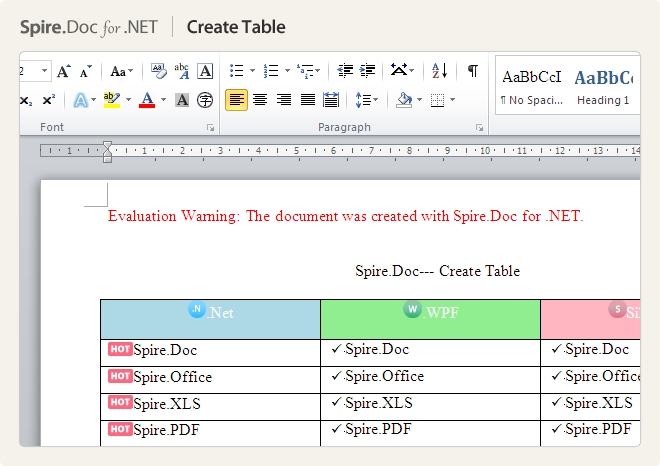 Spire.Doc for .NET is a proven reliable MS Word API for .NET which enables to perform many Word document processing tasks. It supports C#, VB.NET, ASP.NET and ASP.NET MVC. Spire.Doc supports Word 97-2003 /2007/2010 and it has the ability to convert them to commonly used file formats like XML, RTF, TXT, XPS, EPUB, EMF, HTML and vice versa. 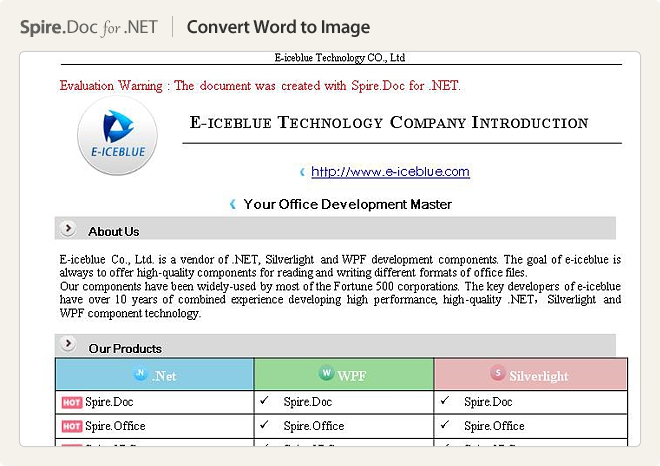 Furthermore, it supports to convert Word Doc/Docx to PDF using C# in high quality. The Difference between Standard and Pro Edition lies in the feature of File Conversion: Pro Edition supports converting files from Word to PDF, Word to HTML, Word to XPS, Word to Text, Word to Image and Word to XML(the Word can be either .Doc or .Docx). Unlike Pro Edition, the standard edition doesn't support conversion of any kind mentioned above. By using Spire.Doc, developers can build any type of a 32-bit or 64-bit .NET application including C#, VB.NET, ASP.NET, Web Services and WinForms for .NET Framework version from 2.0 to 4.0. Spire.Doc for .NET enables developers/programmers to build WinForms, Web Services, ASP.NET and other type for .NET applications from version 2.0 to 4.0 ClientProfile on 32-bit or 64-bit system. 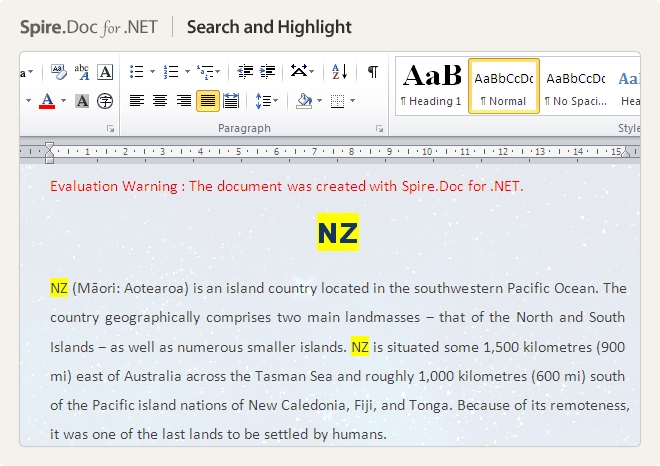 Spire.Doc for .NET enables quick generating, saving, writing and editing Word documents. Generate and save Word documents (Word 97-2003, Word 2007 and Word 2010). Load and save document with macros, including .doc (Word 97-2003) document with macros and .docm(Word 2007 and Word 2010) document. Write and edit text and paragraphs. 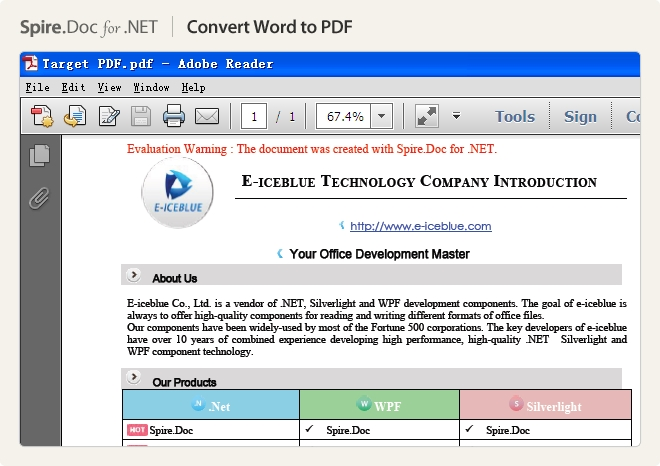 Spire.Doc for .NET enables converting Word documents to most common and popular formats. Interversion Doc-Docx: Convert .doc document (Word 97-2003) to .docx document (Word 2007 and Word 2010) and vice versa. Interversion Doc(x)-RTF: Convert .doc(x) document to RTF (Rich Text Format) and vice versa. Interversion Doc(x)-TXT: Convert .doc(x) document to TXT (Plain Text) and enable to load TXT file and save as .doc(x) document. 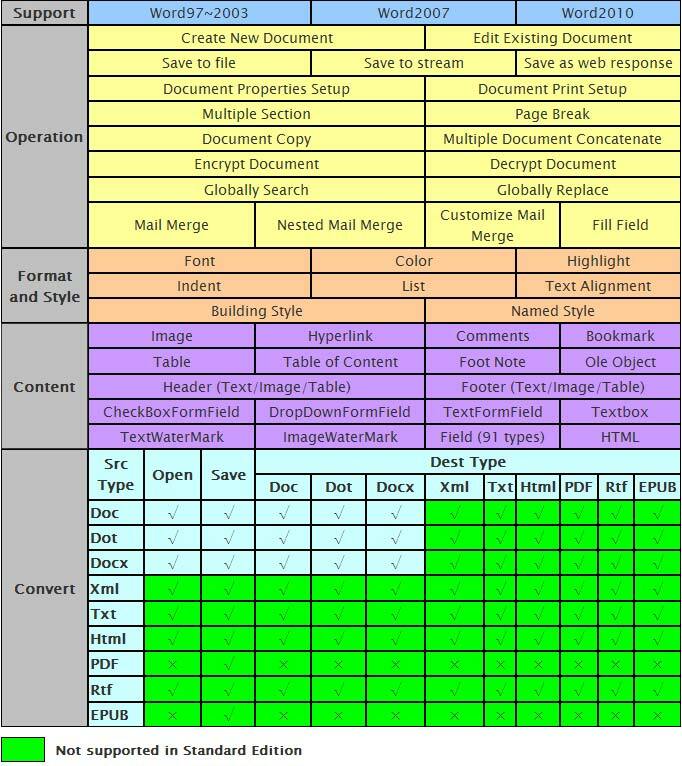 Interversion Doc(x)-HTML: Convert .doc(x) document to HTML file and enable to load HTML file and save as .doc(x) document. Interversion Doc(x)-Dot: Convert .doc(x) document to Dot (OpenDocument Text) and vice versa. Interversion Doc(x)-XML: Convert .dox(x) document to XML and enable to load XML file and save as .doc(x) document. 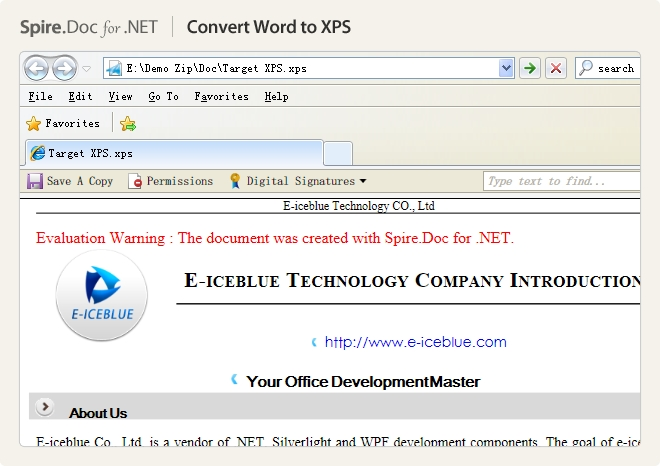 Interversion Doc(x)-XPS: Convert .dox(x) document to XPS document. Unidirectional Conversion: Doc(x)-EPUB: Convert .doc(x) document to EPUB (Digital Publishing). Unidirectional Conversion: Doc(x)-PDF: Convert .doc(x) document to PDF in high quality, including contents and formats. 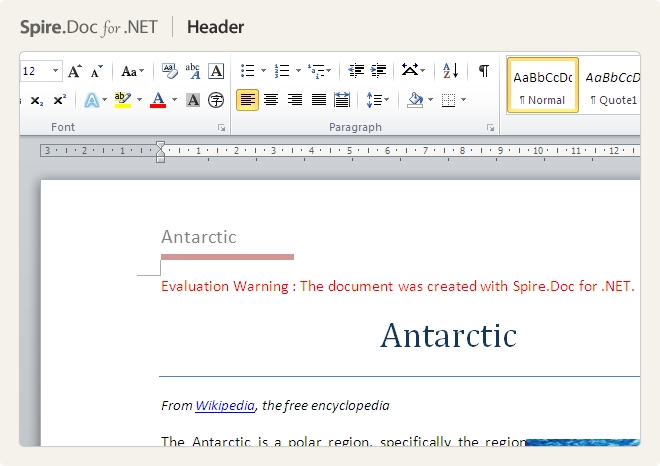 Spire.Doc for .NET enables to inserting, editing and removing external objects in Word. Find and replace specified strings. Copy and remove comment, bookmark, table, texts, paragraph or sections. Merge multiple Word documents into one. Protect documents to prevent from opening, editing, printing etc. Open and decrypt documents in protection. Extract texts, comments, images etc. from document. Load and save document with macros. Remove macros in document. Create form field including elements: cells, texts, radio button, dropdown list, checkbox etc. Fill form field by connecting data from xml file. Create and edit document properties. Clear macros in .doc and .docm document. Spire.Doc for .NET enables formatting contents in documents, including character, paragraphs, pages and whole document. Format all characters in document, including fonts, sizes, colors, effects etc. Format paragraphs, including built-in styles, indents, spacing, bullets, alignment, headings and number list style etc. Format Word tables, including cell fonts and colors, cell background color, cell alignment, cell borders and column width/row height setting. Format Word page, including page breaks, border, margins, paper size and orientation. View document with different document view types, zoom percent and zoom types. 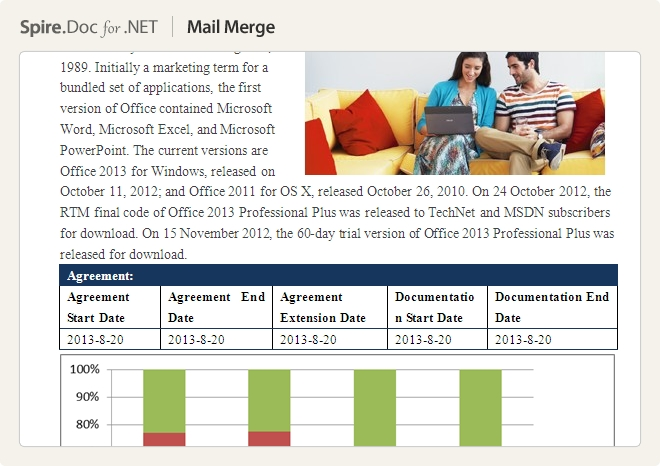 Spire.Doc for .NET enables executing mail merge function to create records, orders and reports. Perform simple mail merge fields (name and value) to create single item. 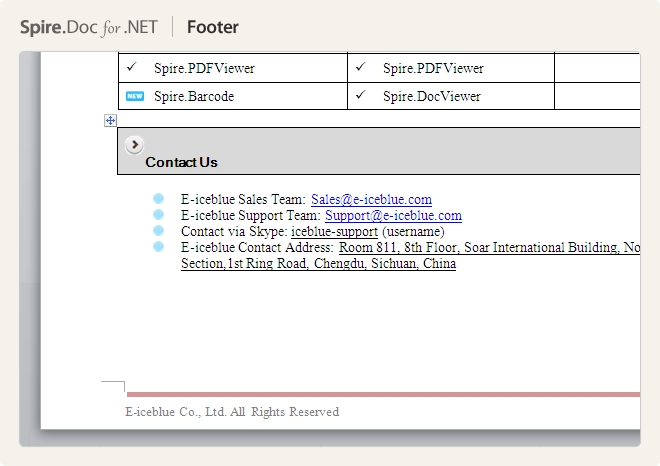 Execute mail merge to create a group of data records with connecting customized data source. Populate document with data from .NET data source including DataSet, DataTable, DataView or any other files (for example, xml) to create large amounts of records or report by using mail merge.